Be Brave, Keep Going: Muffin Tin Monday - No Theme Today! Muffin Tin Monday - No Theme Today! It's time for Muffin Tin Monday, the weekly blog link up where we get to share a Muffin Tin Meal made for the kids over the last week. What's a Muffin Tin Meal? It's just that a meal, snack, lunch or dessert served in a muffin tin. We've expanded the serving containers to include silicone muffin pans, and paper cupcake liners. It's a little less artistic than a bento box meal, but still just as fun. I hope you will join in on the fun! There is no theme this week! Aren't these "silly feet" silicone cupcake molds fun? They just make me want to giggle with their cuteness. They're made by Wilton. I've been featuring quite a number of their products over the past few weeks, thanks to a wonderful package they sent me. It has been so fun to get to share with you how we use Wilton's products to celebrate not only the important days, but also those everyday moments that make lifetime memories. Did you know Wilton uses only food grade silicone in all of their silicone molds, cups, and pans. I was pleasantly surprised at how sturdy the "silly feet" are. 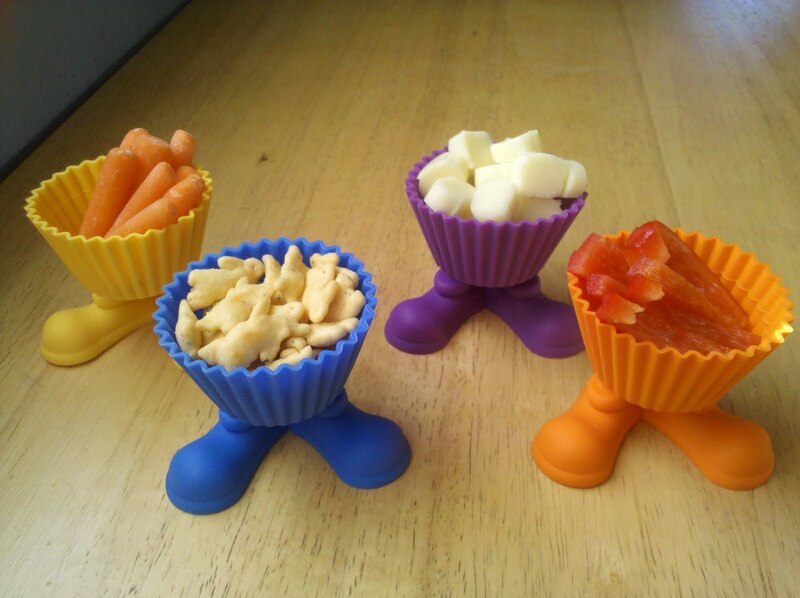 They are perfect for not only cupcake and muffin tin meals, but a variety of treats and goodies. Wilton.com even features ideas for these on their website. So be sure to check that out. Want to join in on the Muffin Tin Monday fun? Here's how: Make a "Muffin Tin Meal" (see above), snap a photo and blog about it or up load it to a photo sharing website and link your blog post or photo URL by clicking on the blue "add your link" button and following a few simple steps. The feet sure are cute. Hope you are having a great long weekend! Love the little feet. Adorable. I have been wanting to join in Muffin Tin Monday for so long!! This is my first time! Thanks for hosting!